This morning I had the opportunity to capture the beauty of two particularly difficult birds to photograph in flight. 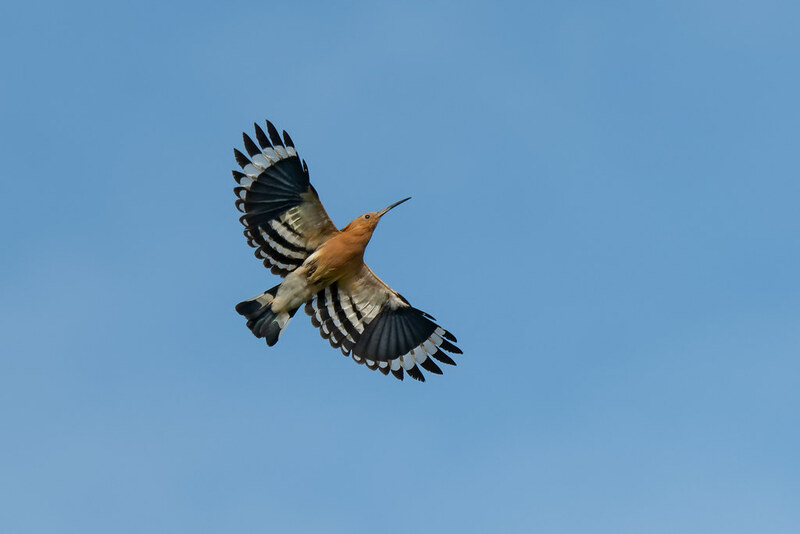 First, the unmistakably stunning Hoopoe. They are calling every morning now and this one was actually in a group of five. Whilst walking near the river this morning I heard a noise that I’ve not heard since the end of September and instantly recognised it as Barn Swallows. I looked to the sky to see 3 of them flying around catching flies for breakfast. Whilst you may think this is early, it is right on time for the Barn Swallows to return at the beginning of February. 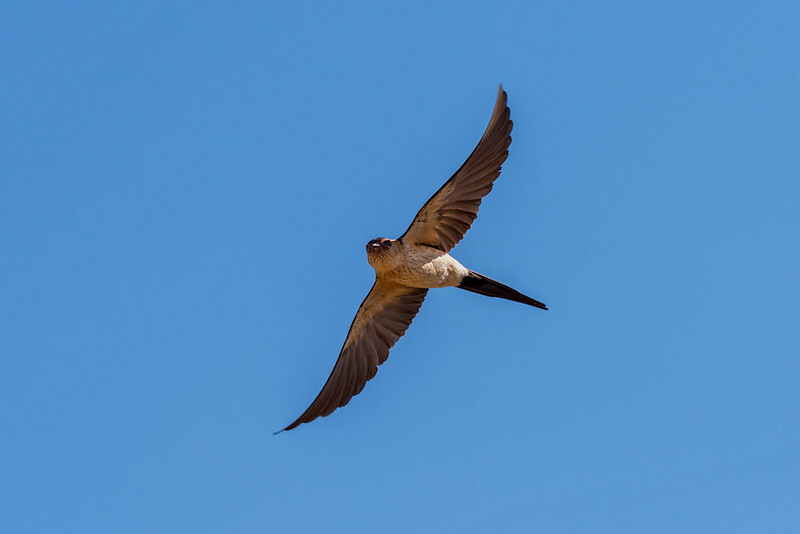 If you want to learn more about the Swallows, Martins and Swifts we can find in the Algarve, take a look at my Algarve Resident article I wrote in July 2018 titled Swallows, Martins and Swifts. Actually, they have been here for many months, however, I hadn’t noticed them. They do return much later in the spring than the Barn Swallows and House Martins. 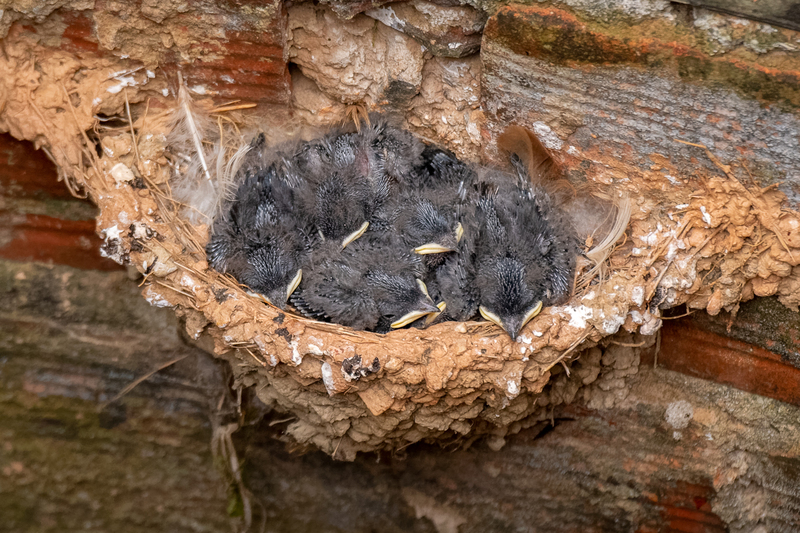 We used to have these nesting in their “tunnel” nests here under one of the terrace roofs at the Quinta, however, at the end of last years breeding season the nest fell off. They don’t normally like nesting around humans so it was no surprise that this year they decided not to rebuild. They normally build nests under cover in uninhabited structures such as bridges. They had built a nest at the Quinta the year before we moved in as it was not permanently occupied then. This morning I took a photo of what I thought was Barn Swallows, but when I looked on returning home, I discovered these are indeed Red-rumped Swallows. They are larger than Barn Swallows and almost totally white underneath whereas a Barn Swallow has a rusty coloured chin. 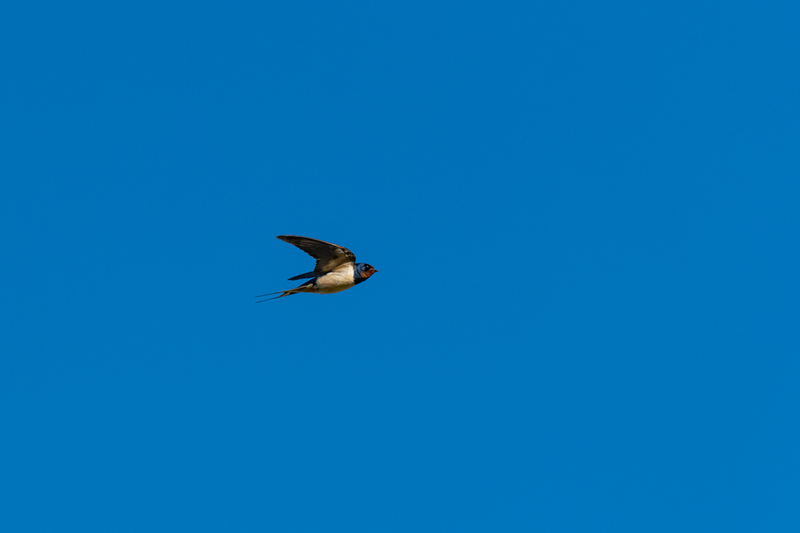 As the name suggests, the Red-rumped Swallow has a rusty coloured rump which is difficult to see in flight. Here is a photo of one chasing a fly, which it did catch. 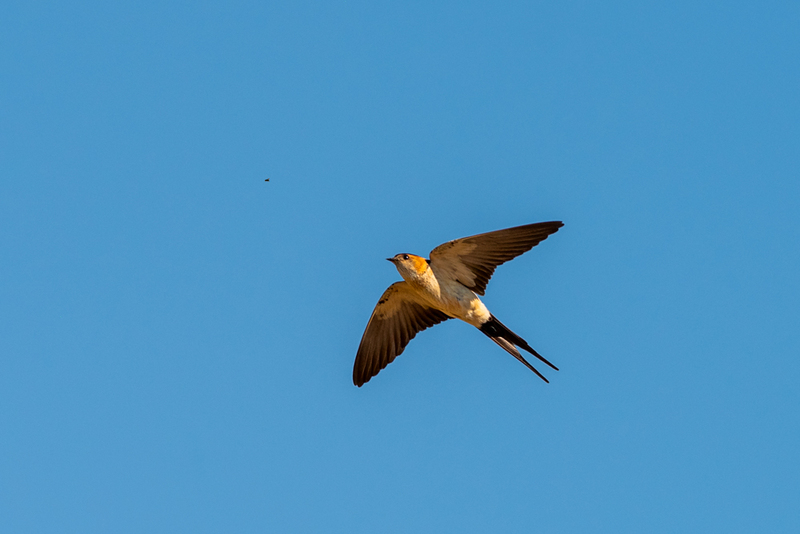 Red-rumped Swallow chasing its breakfast! 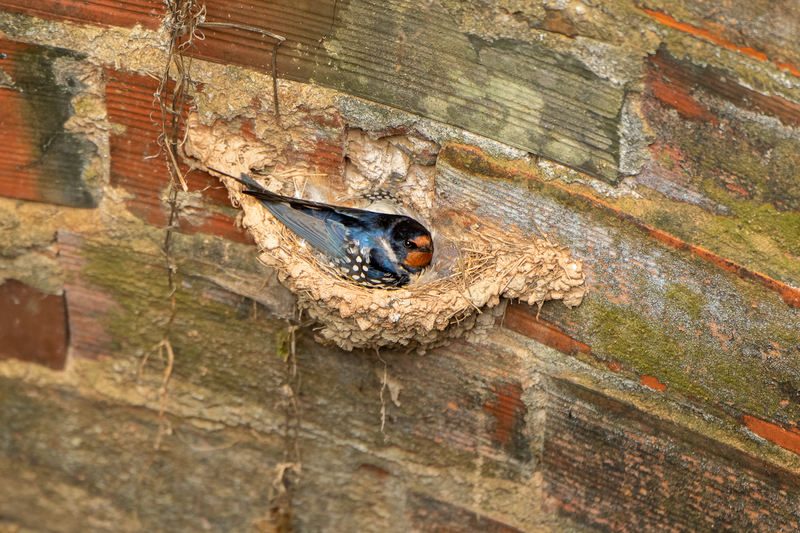 The Red Rump Swallows nest here at our “Quinta” and will be getting ready to leave soon. They arrive later than the other Swallows and Swifts and also leave slightly later too.